Mormon Wookiee: #41: Stormtrooper families can be together forever too. #41: Stormtrooper families can be together forever too. Mormons are familiar with the phrase "Families can be together forever". We believe that if we obey the commandments, accept the gospel of Jesus Christ, and learn to love one another during this life, we will have the opportunity to live together again after we die. When you think about it, that is one of the greatest blessings imaginable. For anyone who has lost a spouse, a child, a parent, or a sibling, there is no greater peace than to know that you can be together again someday. On a lighter (but related) note, don't you think characters from Star Wars have the same desire to be with their loved ones? Of course they do! 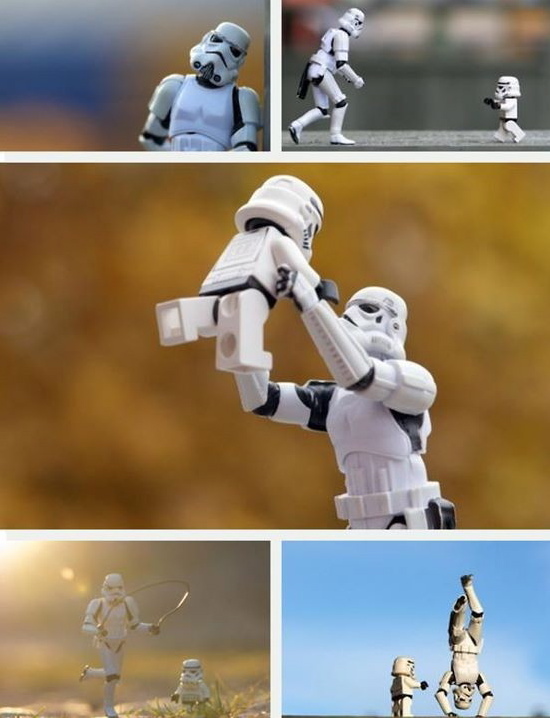 When three of my friends (Michelle, Eric, and Jocelyn) sent me the following picture of a stormtrooper father and son, my immediate thought was "families can be together forever.....even Stormtrooper ones". The picture and many others like it were created by Swedish Star Wars fan Kristina Alexanderson. You can see more of Kristina's work at her Flickr page http://www.flickr.com/photos/kalexanderson/. I am a huge fan! Hopefully this stormtrooper was not on the Death Star....or the other Death Star. But even if he was, families can still be together forever! That's so awesome! Can't wait to show Guy! #39: "Cello Wars" by Steven Sharp Nelson. #35: Some MORE thoughts on General Conference. #34: My New Year's Wookieelutions.